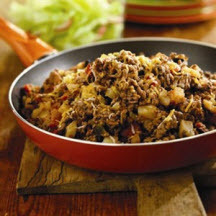 An easy ground beef hash that comes together quickly with the use of frozen hash brown potatoes and a jar of thick and chunky salsa. Complete this "busy day skillet meal" with a simple green salad and sliced peaches sprinkled with cinnamon. Cooking times are for fresh or thoroughly thawed ground beef. Ground beef should be cooked to an internal temperature of 160°F (71.1°C). Color is not a reliable indicator of ground beef doneness. Nutritional Information Per Serving (1/4 of recipe): 422 calories; 19 g fat (9 g saturated fat; 7 g monounsaturated fat); 87 mg cholesterol; 999 mg sodium; 33 g carbohydrate; 3.7 g fiber; 28 g protein; 6.6 mg niacin; 0.7 mg vitamin B6; 2.4 mcg vitamin B12; 3.9 mg iron; 20.3 mcg selenium; 6.2 mg zinc.